Forgive the the momentary detour from the Boston travelogue, but my wife Karen just told me she has been dreaming about Big Gay Ice Cream. "Bea Arthur. I want a Bea Arthur," she said, with a far off look in her eye. "Me too," I replied. If your are scratching your head, if you are confused or concerned, do not worry. I will explain. On a recent, beautiful Sunday afternoon I took Karen and the girls to the Big Gay Ice Cream Shop shop for, of course, ice cream. It was, in a word, fabulous! Big Gay Ice Cream began in 2009 as a food truck. Douglas Quint and Bryan Petroff envisioned the BGIC truck as a fun experiment, offering soft serve in a classic Mr. Softee setting but with more creative and unique toppings. Nilla Wafers and Dulce de Leche were on the menu along with olive oil and sea salt. Served with humor instead of attitude, the truck was a big hit. This success lead to a permanent storefront, the Big Gay Ice Cream Shop. The shop on East 7th Street is a small one. On warm days there is a line to get in, but do not be deterred. It moves quickly and they limit the number of people in the store at once which actually makes it a better experience. You are warmly greeted upon entry, and are immediately set at ease by the welcoming presence of that most magical of creatures, the Unicorn. Unicorns abound, but stay focused on the mission at hand, the ice cream. Soft serve, shakes and ice cream sandwiches make up the bulk of the menu. Coffee and a few other sweets are available. The toppings list runs the gamut from toasted curried coconut and wasabi pea dust to pumpkin butter and key lime curd. If you are one of those people that loves non-tradition sweets, loves the cayenne pepper in chocolate craze, then BGIC Shop is a must. But what if you are more of a traditionalist? What if the sound of a Mr. Softee truck gets your taste buds going. 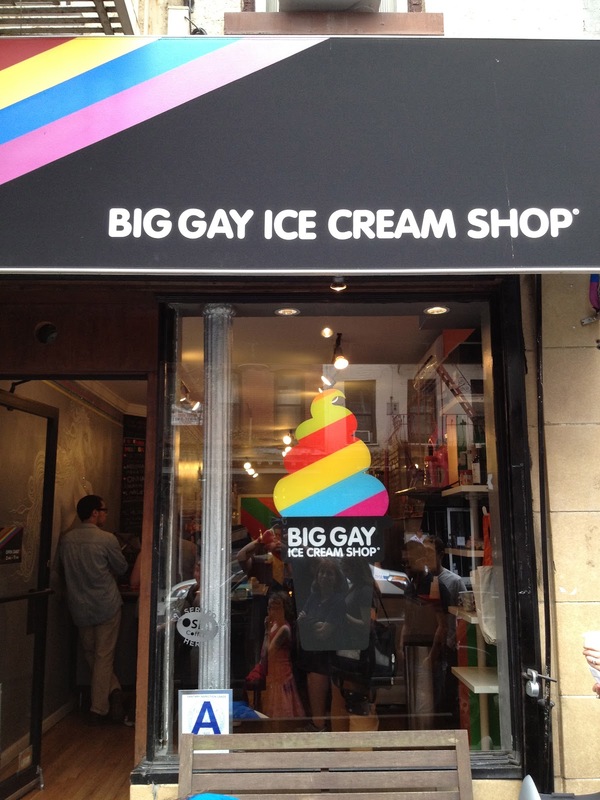 Well my friend, the Big Gay Ice Cream Shop is definitely for you. And I would recommend, on your first visit, focusing on the specialty cones. Tongue planted firmly in cheek, each specialty cone is given a funny or risqué name. How about a Salty Pimp (vanilla ice cream, dulce de leche, sea salt and chocolate dip)? A Cococone (vanilla ice cream and toasted curried coconut)? As a huge chocolate dip fan I went for the American Globs on our visit. Consisting of vanilla ice cream, pretzels, sea salt and chocolate dip, American Globs improves on something I considered perfect, the chocolate dip cone. The pretzels add a crunchy bite and with the sea salt they add balance to the sweetness of the ice cream and chocolate dip. Happy happy. I didn't think it could get better than the American Globs. But then I tasted the Bea Arthur. When two gay men start an ice cream shop and name a cone after Bea Arthur, it had better be damned good. BGIC Shop's Bea Arthur is better than good, it is perfection in a cone. The Bea Arthur has three ingredients; vanilla ice cream, dulce de leche and crushed 'nilla wafers. This may be the Holy Trinity of ice cream. There is a hint of homage to the Good Humor Toasted Almond Bar here, but it surpasses that classic treat. 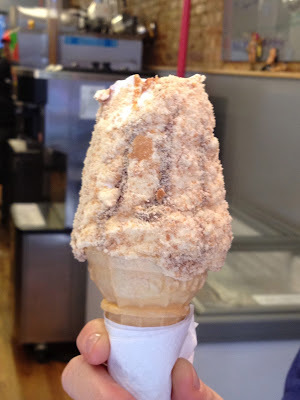 Delicious vanilla ice cream is drizzled with dulce de leche then coated in 'nilla wafer dust. This is the cone my wife's dreams are made of. Mine too. I will be back, and back again for the Bea Arthur. And there are so many more treats I want to try. The Monday Sundae (twist ice cream, Nutella lined cone, dulce de leche, sea salt and whipped cream) has my name written all over it. There may not be anything better than riding a unicorn over a rainbow, but the sweet treats at the Big Gay Ice Cream Shop come close. and these lungs have sung this song for to long. Have you ever try to write an admission essay about meal? I've heard one guy apply with pizza essay to Yale! Look here https://topadmissionessay.com/blog/how-to-find-a-helpful-sat-essay-example-to-improve-your-writing-and-results for more good stories.